According to local legend, Vittorio Amedeo, the young Duke of Savoy had been frail and sickly since birth. Unable to digest most foods, in 1675, his mother asked the court doctor, Teobaldo Pecchio, for assistance in curing her son. Pecchio, who suffered from similar ailments as a child, immediately diagnosed the Duke with food poisoning as a result of eating bread harbouring pathogenic germs. At the time, the typical bread of Turin, the ghërsa, was not always prepared hygienically nor cooked through entirely. Pecchio thus commissioned Antonio Brunero, a local baker, to reproduce a longer, thinner and crisper version of the ghërsa (the ghërsa was baguette-like in shape) to ensure there was no soft crumb on the inside and all potential germs were killed. Vittorio Amedeo was fed Brunero’s ghërsin (literally, ‘little ghërsa’), cured of his childhood maladies and went on to reign as Vittorio Amedeo II, Duke of Savoy and King of Sicily and Sardinia until 1730. The grissino (the Italianised word for ghërsin) was born! Easy on the stomach and of a longer-shelf duration than other breads, Pecchio and Brunero’s creation turned out to be a great success. One of Vittorio Amedeo’s descendants, Carlo Felice II, was said to be so enamoured of grissini that he annoyed fellow spectators by constantly munching on them while watching the opera at the Teatro Regio[i]. Napoleon Bonaparte was not immune either to the charms of what he called ‘les petits batons de Turin’. 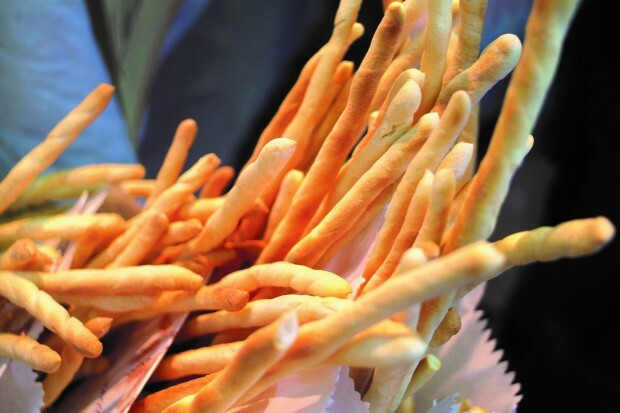 Some sources claim that the courier service between Turin and Paris which he founded at the turn of the 19th century was mostly for the purpose of having fresh grissini delivered to him daily! These days, you will find two main types of grissini. The most traditional type is the rubatà (meaning ‘rolled’ in Piedmontese). Rubatà generally vary from 40 to 80 cm in length. They are rolled by hand and as a result of this, have a characteristic twisted look about them. The other type, the stirato (literally, ‘ironed’ in Italian), is a more recent invention. Instead of being rolled like rubatà, they are pulled at the ends. This method lends itself more easily to mechanised production. Most packaged mass-produced breadsticks are grissini stirati. There are many ways of eating and serving grissini, ‘rolled’ and ‘ironed’ alike. In most Piedmontese eateries, they are served in extra-long breadbaskets called portagrissini for diners to nibble on while waiting for their antipasti to arrive. Bars often serve them with a lovely slice of prosciutto crudo wrapped around them for aperitivo hour. My husband swears by crushing them in soup or in caffellatte for breakfast. I must confess though, I love nothing more than dipping a grissino in a jar of crema gianduia[ii]. The following recipe, loosely based on Sonia Peronaci’s, is for grissini stirati. Pour a small a quantity of the amount of water indicated in a small bowl and add fresh yeast and malt. Stir and allow to dissolve. Mix flour, dissolved yeast (and malt) and remaining water in a large mixing bowl. Transfer dough to clean and well-dusted work surface. Add salt and knead until dough is smooth and elastic. Flatten dough slightly to give dough the form of a rectangle. Brush dough with olive oil or water. Dust dough with durum wheat flour. Leave dough to rise until doubled in size . Cut dough width-ways into strips about 1cm wide. Take a strip and hold each end with both hands. Pull until grissino is as long as oven tray. Place grissino on oven tray. Repeat procedure with the rest of the strips (N.B. the grissini should not be placed too close to each other on the tray). Bake in oven for about 20 minutes or until crisp and a nice golden colour. Serve in a vase or an extra-long bread basket at meal time. The beauty of handmade grissini is in their imperfections, so do not be disappointed if their shape is not what you thought they would be. Each grissino is unique and they are not meant to be completely straight. Once you feel comfortable with the basic recipe, you may also wish to try making a gourmet variant. If so, simply brush grissini with water or olive oil and sprinkle a condiment of your choice (poppy seeds or rosemary, for example) on top before baking them in the oven. [i] The Royal Theatre of Turin. [ii]This is the chocolate-hazelnut spread typical of Turin. [iii] In Italy, this type of flour is sold as Farina di Manitoba Tipo 0. [iv] This addition is to feed the yeast the amalyse (or sugar) it needs to ferment. [v] If you want lighter grissini, I would recommend using water. [vi] In Italy, this type of flour is sold as Farina di Grano Duro or Semola.